Postulant receives the monastic habit from the Bishop Visitor. who are open to learning responsible, adult obedience, accepting a common Rule and the wisdom and judgment of others in community life. an unselfish capacity for cheerfulness, simplicity and mortification of self. Bishop Horatio Potter, the sixth Bishop of New York, instituted the fledgling community in 1865 with the condition that they choose St. Mary as their patroness. Following the example of the Blessed Virgin Mary, our sisters seek perfection in discerning and doing the will of God, and allowing the power of the Holy Spirit to overshadow our lives. The only answer we can give for dedicating our lives to God under the vows of poverty, chastity and obedience according to the Rule of the Community of St. Mary is that God calls us. He called us when we were outside in the world, and he continues to call us each day. We know that only the love of God can ever satisfy our hearts. Some of us came in the fervor of youth, for all the selfish reasons one could imagine; but God kept calling us into his love for his reasons. Some of us came after a full life in the world. Only God knows why the time of his calling is as different as each of us - as we are diverse in appearance and abilities. What we have in common is that we want to give ourselves away — to be a witness to God's love in prayer and worship, in service to God’s people and the larger world, in fellowship with one another. The spirit of any religious organization like any human character, is marked by gradual growth and development. It evolves a corporate personality, gradually communicated to it by the Holy Spirit. Discernment presumes the development of this corporate value: a growth in a kind of mutual asking whether taking the habit of a religious is God's call and also both the woman's and the community's choice. 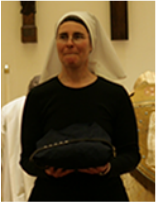 The habit and a new name in Religion are given during the clothing ceremony, during which the Postulant is formally received as a novice sister in the Community of St. Mary. This ceremony at C.S.M. is simple and marks the beginning of two to three years of training in the religious life. In addition to sharing the professed sisters' regular times of prayer, work and study, novices have classes in the Rule and customs of the Community, prayer, the Bible and Christian doctrine, monastic and church history, and liturgy. Work is simple to keep mind and heart open to developing the deep resonances of prayer. If after two or three years the woman and the Community agree, the white veil and round collar of the Novice are exchanged for the square collar and a blue-grey veil of a junior sister. The juniorate is a time of continued testing of vocation but without the routine of classes and training. Junior sisters are assigned greater responsibilities within community life, but take no vows until life profession. The process of postulancy, novitiate and juniorate takes place over a period of five to seven years. At any time during this period of discernment, a woman may leave the Community or may be asked to leave without censure. At the end of this time, application may be made for life profession and an election by the entire Community is held. The profession ceremony for a Sister of St. Mary is a public event. It begins with the sister-elect making life vows, giving her life wholly to God before his representative, the Bishop Visitor. She then receives the knotted cincture -- symbolically enclosed and bound to God within her newly made vows of the Evangelical Counsels -- poverty, chastity and obedience. She is presented with an ebony cross banded with silver and bearing the lily, representing Christ and the Blessed Virgin Mary. The black veil of a professed sister is given as a sign of her being set apart from the world, and the Bishop Visitor places a wedding ring on her right hand as a sign of Christ's acceptance of his bride. The ceremony is completed with the solemn celebration of the Holy Eucharist. Since the third century, the unique witness of "widows and virgins", "nuns" (from the feminine Latin root for "monk") or "religious sisters" has been recognized as a lay Christian witness -- as an icon of the Church. Life profession for a religious in the Anglican tradition carries the same weight as the marital vow, and sisters embody the type of the Bride of Christ, awaiting full consummation of the hope of all the Church for Christ's return at the end of time. All contents of this site copyright 2017 Sisterhood of St. Mary, Inc. -- including graphics, text, photos, and video.